Credit cards have long been the preferred payment for goods in the United States, now mobile payment solutions and credit card perks for purchases have paved the way for restaurants to transition to a cashless business. According to the 2016 U.S. Consumer Payment Study conducted by Total System Services (TSYS), 40% of Americans prefer to pay with credit, 35% opt for debit, and 11% choose to pay with cash. When broken down by age and income, only 5% of those between 25 and 34 years old use cash and 99% of consumers with a household income over $100,000 use credit or debit for purchases. While there is no direct data counting the number of restaurants that have adopted a cashless policy, there are some notable adopters such as Tender Greens with its 28 units. Starbucks recently made one of its shops in its hometown of Seattle cashless, and even Shake Shack is experimenting with cashless kiosks in one of its New York restaurants. The restaurant Sunday in Brooklyn, located in, you guessed it, Brooklyn, N.Y., has been cashless since it opened in 2016. Going cashless can speed up the line during the rush, particularly for quick-service and fast casual concepts. For example, the restaurant chain, Sweetgreen, reported a significant 5-15% increase in transactions per hour by opting for cashless transactions. Having no cash means that you will be a significantly less desirable target for robbery, and employee “skimming” and cash shortages in the till become a thing of the past. No more “runs to the bank, making change, counting tills and server checkouts, reconciling cash and making deposits. Cashless operators often report that not dealing with currency related activities allow more focus on customer service. Using credit cards and digital payments formats allow operators to collect data and provide better insights on guests. It enables target marketing and makes loyalty-based programs easier to implement. Cash is still a prominent method of payment in the U.S. representing 32% of all transactions. It is the most liquid, simple to use, and egalitarian form of payment. Credit card companies charge on average 2-5% percent, that can really add up and operators would have to accept a cut in profit on every cashless transaction. Offsetting this means you will likely have to increase your prices. Teens and Children don’t have credit or debit cards, and some people are not in a position to have one of these cards. The choice to go cashless can be a very polarizing decision. 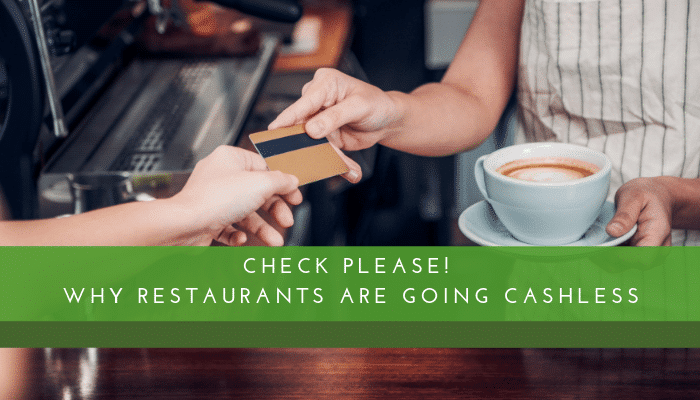 Restauranteurs need to evaluate their business model, clientele and demographics to make a qualified decision, as to whether they should consider becoming part of the growing cashless community. We at KROST have been helping restaurant owners and operators grow their businesses and become more profitable for nearly 80 years. Please contact Robert A. Benson at (818) 616-7377 or (robert.benson@krostcpas.com) if would like to schedule a complimentary one-hour consultation for your restaurant. ← Where Do You Stand with the ACA?